Transparency Market Research (TMR) has published a new report titled ‘Healthcare Information Systems Market - Global Industry Analysis, Size, Share, Growth, Trends, and Forecast, 2018–2026.’ According to the report, the global health care information systems market was valued at US$ 227,021.4 Mn in 2017 and is projected to expand at a CAGR of 9.6% from 2018 to 2026. Increase in government initiatives and increase in adoption of health care IT products by health care providers are expected to boost the global health care information systems market from 2018 to 2026. North America is anticipated to dominate the global market during the forecast period owing rise in collaborations between companies for technological advancements, increase in government initiatives, and rise in private and public funding in health care information technology companies. For instance, in January 2017, Royal Philips and Banner Health entered into a multi-year partnership to innovate and expand on their successful joint connected health care programs such as the Intensive Ambulatory Care (IAC) pilot and Telehealth programs. The market in Asia Pacific is expected to expand at a high CAGR during the forecast period. Expansion of the market is attributed to rise in incidence rate of chronic diseases, increase in geriatric population, and increasing government initiatives. For instance, in July 2016, Japan's Ministry of Economy, Trade, and Industry announced plans to launch a demonstration project to improve diabetes management through the utilization of IoT and health information. Advancements in health care information systems has led to significant growth of the market in the recent years. Use of health care information systems in medication management, electronic prescribing, intelligent wearable technologies to curb lifestyle diseases, and smart robots to automate repetitive tasks is expected to significantly reduce health care costs and boost the market. Adoption of IT products and solutions in health care as encouraged through government initiatives and increase in need to curtail escalating health care costs are further expected to propel the market during the forecast period. The report offers detailed segmentation of the global health care information systems market based on application, component, deployment, end-user, and region. In terms of application, the health care information systems market has been segmented into hospital information systems, pharmacy information systems, laboratory information systems, medical imaging information system, and revenue cycle management. The hospital information systems segment has been further divided into electronic health records, electronic medical records, real-time health care, patient engagement solutions, population health management, and others. The pharmacy information systems segment has been further categorized into prescription management, automated dispensing systems, inventory management, and others. The medical imaging information systems segment has been further split into radiology information systems (RIS), monitoring analysis software, picture archiving & communication systems (PACS), and others. Based on application, the hospital information system segment accounted for a prominent market share owing to a wide range of application of the systems, including automation of administrative, financial, and patient care activities of hospitals; production of extensive management reports and operational statistics; and a powerful query module. In addition, these systems provide benefits such as easy access to patient data, reduce scope of error, increase security, provide better cost control, and improve efficiency. This is likely to drive the segment during the forecast period. However, high implementation and maintenance cost present a constraint to the market. Based on deployment, the health care information systems market has been segmented into web based, on premise and cloud based. Based on component, the health care information systems market has been segmented into software, hardware and services. Based on end user the market is segmented into hospitals, diagnostics centre, academic and research institution and others. Based on region, the market has been categorized into North America, Europe, Asia Pacific, Latin America, and Middle East & Africa. 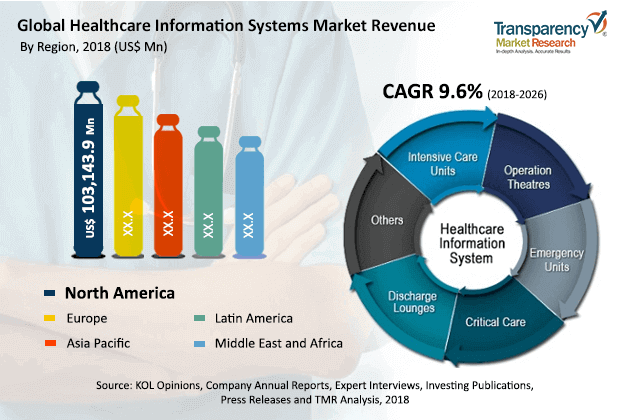 North America held a significant market share of the global health care information systems market in terms of revenue in 2017 due to high adoption of health care information systems in public and private hospitals, introduction of health care reforms, and technological advancements. In addition, government initiatives to promote usage of health care information systems in these regions are further anticipated to drive the market in the coming years. Europe accounted for a key share in the health care information systems market in 2017, in terms of revenue. Factors attributed to the expansion of the market in Europe are rise in patient population, advancement in diagnostic techniques, and increased adoption of health care information systems in various government organizations. The market in Asia Pacific is expected to expand at a prominent CAGR during the forecast period. Emerging markets in Asia Pacific hold immense expansion potential due to factors such as rise in prevalence of chronic diseases, increase in government initiatives, and increase in health care infrastructure. Moreover, adoption of new and sophisticated technologies, advances in diagnostic technologies, and increase in partnership of government with private players and clinical laboratories are likely to propel the market in the coming years.